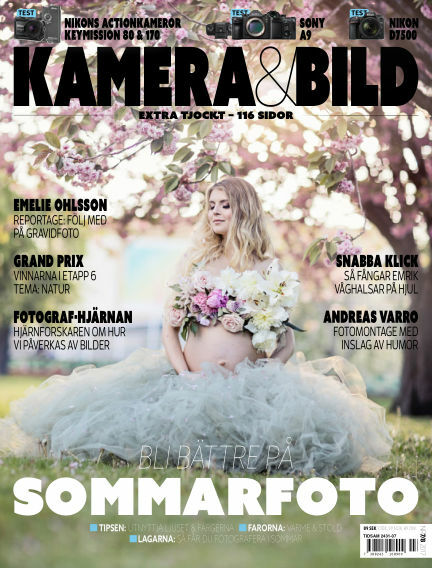 In this issue of Kamera & Bild : Extra tjockt nummer – 116 sidor! TESTER: Nikon D7500, Sony A9 & Keymission 80/170. FOTO FÖR VETENSKAP: Fotografhjärnan bakom alla bilder. SKOLA: Sommarspecial – Tipsen, farorna och fotolagarna. REPORTAGE: Vi följer med Emelie Ohlson när hon gravidfotograferar. INTERVJUER: Emrik Jansson & Andreas Varro. GRAND PRIX: Etapp 6 avgjord. KRÖNIKA: Sophie Odelberg. Och mycket, mycket mer! With Readly you can read Kamera & Bild (issue 2017-07-04) and thousands of other magazines on your tablet and smartphone. Get access to all with just one subscription. New releases and back issues – all included.